This January, orchid societies and commercial orchid dealers from all around the country will be headed to the Gautier Convention Center for the the Annual Gulf Coast Orchid Show and Plant Sale. There will be tours and classes available, and growers will be participating in a judged plant display contest. At the show, you will have a number of opportunities to meet fellow orchid-lovers, view orchid exhibits, and purchase orchids to take back to your own garden. The event is hosted by the Gulf Coast Orchid Society, who were awarded a Silver Certificate by the American Orchid Society in 2011 and garnered over 20 ribbons at the 2011 Southwest Regional Orchid Growers Association Show. They will be showing off their award-winning plants alongside other accomplished growers at the Annual Gulf Coast Orchid Show and Plant Sale. This three-day event is just around the corner, and it only takes place once per year. 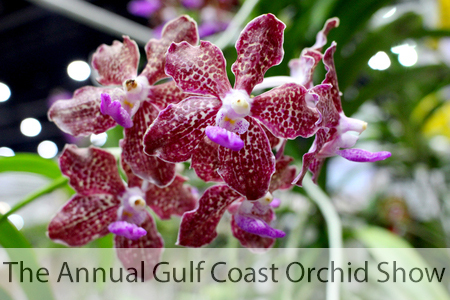 Be sure to put the Annual Gulf Coast Orchid Show and Plant Sale on your calendar today. You're not going to want to miss this.